The leafy part of the plant that is chopped and dried when the seeds are ripe. In olden times herbalists liked to prepare their tinctures from the green flowering unripe wild Oats but many attribute equal virtue to the more mature golden variety. Oats have been a staple food for many generations and the regular consumption of Oats helps to promote healthy skin, hair, nails and teeth. Whole oats help to lower cholesterol and provide a particularly nourishing food for the blood and fibre for the bowel. The tradition of using the 'straw', the dried herb of the oats plant, as a medicine also goes back a long way and has a strong theme of being used for nervous system disease and debility. Oats have been used to treat conditions such as headaches, migraines, shingles and fatigue. 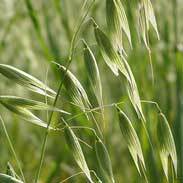 Oats tincture and Oatstraw tea have been recommended for degenerative wasting conditions such as multiple sclerosis and there is a history of using Oats in epilepsy treatments. In Europe there is a long tradition of using Oatstraw in baths as a treatment for rheumatism and painful muscles as well as for kidney of bladder problems. Oats have been used to help lift a depressed mood and help people who are withdrawing from addictive drugs or alcohol. 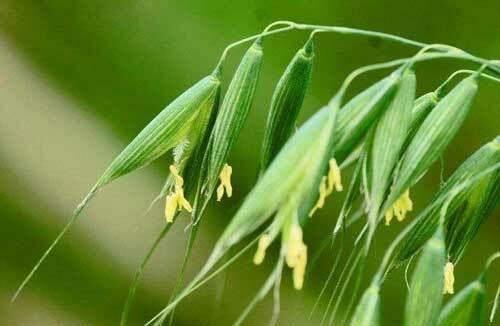 "Administration—Avena Sativa should always be given in appreciable doses. Fifteen drops, three or four times daily, well diluted, will usually meet the case. It may be given in doses of from five to sixty drops in rare instances. It should, however, never be given in larger quantities than twenty minims unless the patient is thoroughly accustomed to the remedy, and has found the usual dose insufficient. Otherwise there is danger of obtaining the physiological effect of the drug, which is announced by pain at the base of the brain. When this symptom makes its appearance the medicine should be discontinued for a day or two, and then given in reduced doses. If administered in hot water during the day, its action is much quicker, and in cold water at night on retiring it has a more extended influence. When given in hot water, its action at times, is almost instantaneous. Physiological Action—Its selective influence is directly upon the brain and upon the nutritive functions of the organism, increasing nerve force and improving the nutrition of the entire system. The influence of a single full dose is promptly felt, similar to the influence of any active stimulant, but more permanent. 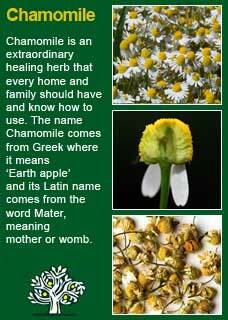 It is a stimulant, sedative and direct nutritive tonic, apparently restoring the wasted elements of nerve force. Specific Symptomatology—The following indications for the use of this remedy are given by King: Spasmodic and nervous disorders, with exhaustion; the nervous debility of convalescence, cardiac weakness, from nervous exhaustion....in general neurasthenia it promptly relieves the almost unbearable occipital headache common with nervous exhaustion. 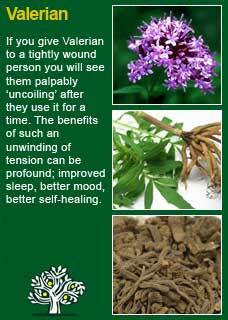 It is a remedy of great utility in loss of nerve power and in muscular feebleness from lack of nerve force. In the overworked conditions of brain workers; ministers, physicians or lawyers—in the general prostration from great anxiety and worry. With these, there is so-called nervous dyspepsia, atonicity, in fact, of the entire gastrointestinal tract. There is heart feebleness with some irregularity; there is cool skin and cool or cold extremities: there is melancholia, irritability, peevishness, vagaries of thought, morbid desires and fancies, usually accompanied with autotoxemia which demands persistent elimination. With these avena is directly indicated. In sexual neurasthenia it is the remedy par excellence, as it has a selective influence upon the nerve structure of the genito-urinary apparatus. Therapy—It will be found directly serviceable in paralysis and wasting disease of the aged, in nerve tremors, and especially in chorea and in paralysis agitans. It has been beneficial in epilepsy. In the convalescence of prostrating disease, and during the asthenic or later stages of inflammatory disease... because of its selective action upon the nervous structure which supplies the reproductive organs, it will be found to allay nervous excitement, nervous palpitation of the heart, insomnia and mental weakness, or failure and general debility. It is a sovereign remedy in impotency. This writer has had better satisfaction in the use of this agent in the temporary impotence of young newly married men, than from any other single remedy or combination of remedies. 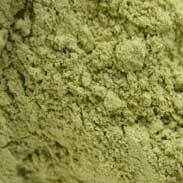 If there be prostatic or other local irritation, a combination of this agent with saw palmetto will cover the field. The nervous headaches of the menstrual epoch, especially those accompanied with burning on the top of the head, and sick headaches apparently from disordered stomach at this time, or in fact sick headache at any time if accompanied with nervous weakness, are all promptly benefitted by Avena Sativa... In atonic amenorrhea with great feebleness, it is valuable. 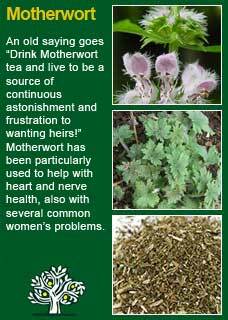 In neuralgic and congestive dysmenorrhea, with slow and imperfect circulation and cold skin and extremities, it is an excellent remedy. This agent exercises a restorative power in overcoming the habits of alcohol, tobacco, morphine, and opium. It will enhance the value of other prescribed agents. 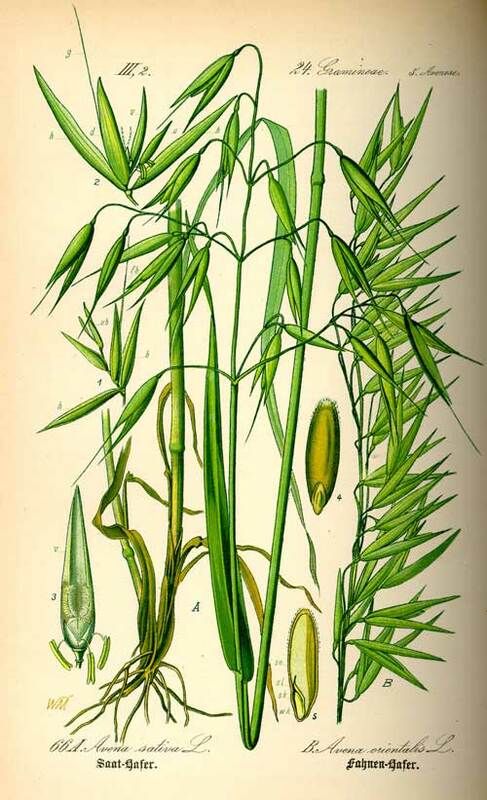 There is no danger of forming the habit of taking Avena, as it can be suddenly abandoned at any time without evil consequences, even when given in large quantities"
The British Herbal Pharmacopoeia (BHP) describes the actions of Oats root as 'antidepressive, thymoleptic (a medicine that modifies a patient's mood) and a cardiac tonic'. 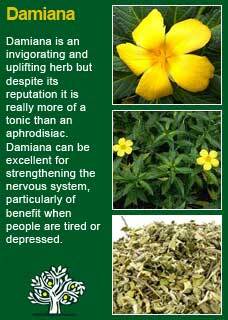 It says it is indicated for 'depression, melancholia, menopausal neurasthenia ( a condition characterized by lassitude, fatigue, headache, and irritability, associated chiefly with emotional disturbance) and general debility and that it is specifically indicated for depressive states'. 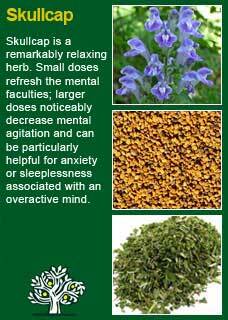 The BHP suggests combining it with Skullcap and recommends a dose of 1-5mls of the 1:5 tincture in 45% ethanol. No adverse effects are expected from taking Oats extracts, even in high or frequent doses. It may be confidently taken during pregnancy or whilst breastfeeding and used by the young or old with safety. There is a clue to the unexpected power of Oats in how it has been used in the withdrawal from drugs or alcohol. If you look into this usage you will see that it is not an isolated idea from just one community but rather oats extracts have been highly rated as helping with withdrawal by diverse people in different places around the world, including being used for the most severe opiate addicts. Oats seems like such a commonplace herb that it is easy to under-rate its virtue by comparison with more exotic, expensive and rare plants, -- but of course this is just the perspective gathered by familiarity. The truth is that, just as the food of the oats seed is greatly fortifying to the body, so the tea or tincture from its herb can be remarkably strengthening and uplifting to the mind. When you give Oats tincture or Oastraw tea to someone who is exhausted and/or wound up you can usually see a visible effect over a matter of days. Oatstraw works at a deep level in the nervous system to nourish and support and you can see and feel how people relax and become happier from its consistent use. 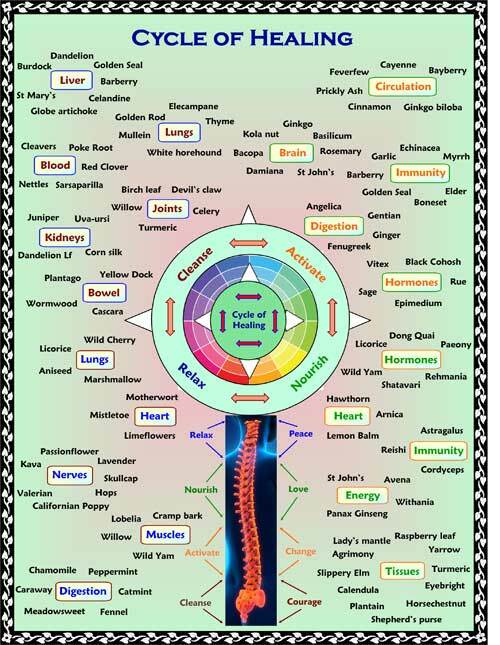 If you who are reading this are studying herbal medicine or if you have your own reasons to want to know this plant ally at a much deeper level then I recommend you take a small dose (e.g. one tsp) of the tincture of Oats or alternately drink a cup of Oat Straw tea and then, with a quiet and attentive mind, closely observe its 'action' i.e. how it makes you feel. At the very least you will likely feel very relaxed from it, perhaps you will have some further experiences of your own that I would rather not over-influence before-hand. The effects of Oats go deep but they are likely to be subtle so you will need to keep 'tuned-in' for a while but I think you will eventually feel for yourself how this is a plant medicine that gets right into the deep parts of the nervous system... in any case, the best way to embrace this old experiential way of learning is to just do it! I don't think you can overdo teas or tinctures from Oats and it is an entirely safe herb for any age or time of life. That said there will unlikely be a greater benefit from taking more than what is a solid therapeutic dose which I would personally see on average as several grams of the tea and between 4-5 mls of the tincture in a day. 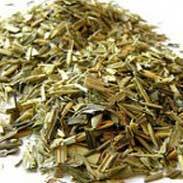 Oatstraw combines perfectly with Damiana for nourishing the nerves, with Valerian for soothing a stressed nervous system, with Motherwort for relaxing physical tension from the heart, and with Skullcap for releasing nervous tension from the head and with Chamomile as an overall calming and nurturing tonic for all ages. Much of the information here about the traditional uses of Oats is consistent with the model of thinking whereby one may treat problem A with plant B.